On the Friday 9th September 8 members congregated in Edinburgh to hand over the Elcho shield to the Lord Provost of Edinburgh for display. This is the third year in a row that the Right Honourable George Grubb has entertained us but the first time we had met his equally charming wife sporting the Lady Provost's chain of office. It was a very pleasant way to spend a morning in the rain of Edinburgh for those members en-route to Blair Atholl. 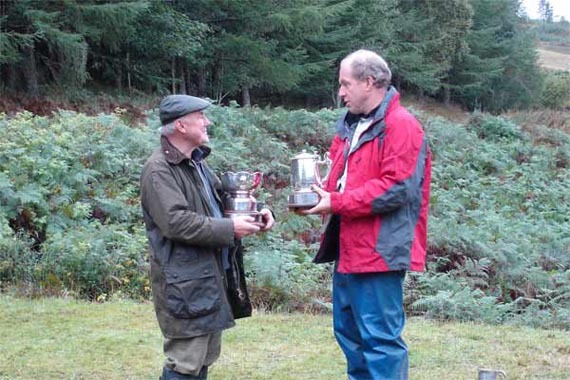 The club held its annual open autumn meeting at Blair Atholl over the weekend 10/11th September. The weather was dismal - heroically dismal with almost continuous rain. 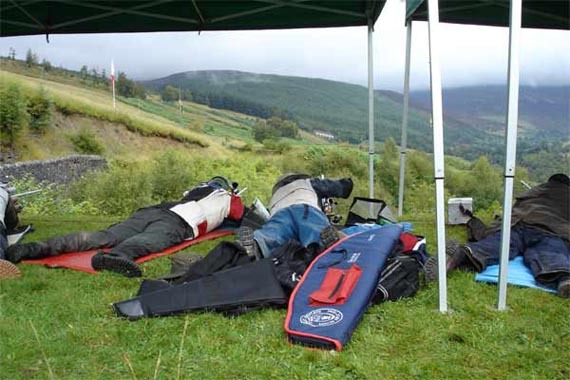 However, thanks to the WARC gazebos, shooting did take place with only a minor reduction in the advertised program from 100 to 95 shots per person and with the largest entry for a few years. The early leaders were father and son Whitby with the only two possibles at 1,000x. Angus McLeod, on leave from sunnier climes, then produced a stunning possible at 1,100x before Hamish Hunter produced one of his best shoots for some time to win the 1,200x stage. On Sunday it was the turn of Mark Crichton Maitland (98@1,100) and some of the Elcho captains to shine including Allan Campbell-Smith (97 at 1,200x) whilst current captain Mike Baillie-Hamilton counted out his immediate predecessor Colin Hayes for the Sunday aggregate. Your correspondent wrongfully thought Mark Haszlakiewicz had top scored at 1,100x but he was unable to repeat his fine Saturday score of 98 due to a dodgy trigger. Astute readers will note that no one person gets more than one mention amongst all this. 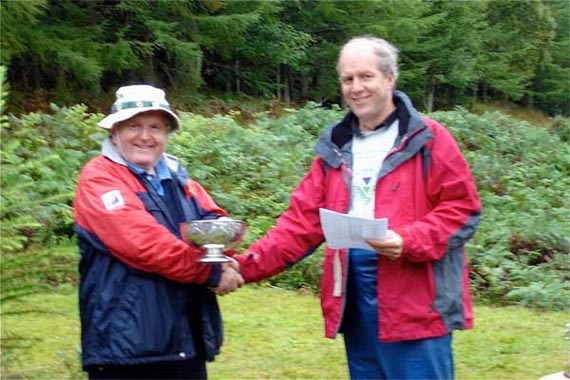 Indeed the result was remarkably open and it was not obvious till the end that Colin Hayes had pulled out a three point lead overall to take the Maxwell and Sandeman trophies. Simon Whitby was high visitor for the Brown Tankard and Hamish Hunter won the Brodie trophy for the 1,200x aggregate. 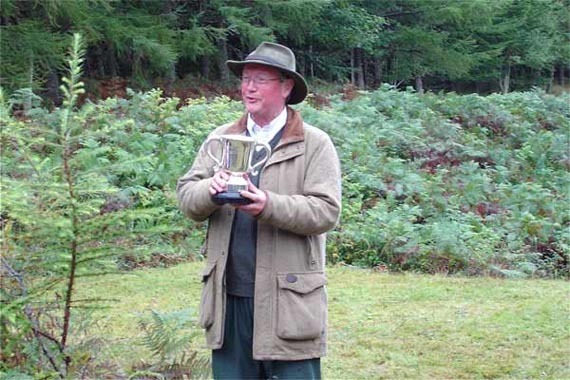 Mark Crichton Maitland had kindly donated a new trophy for the highest Match Rifle Tyro and promptly won this himself. The meeting was not without problems and may have seen the first result spoiled by a faulty electronic target on this range. Angus McLeod, veteran of the Delhi games fiasco, suffered a dismal final shoot along with three others with several difficult to explain shots which saw him fall from a two point lead to five points in arrears. Afterwards it was apparent that the soundbox on this particular target had suffered impact damage. The generally excellent targets are perhaps the victims of their own popularity because a very large number of shots have gone through them in four years and the centres are suffering damage which WARC are only just learning how to deal with. Also the range access road has suffered due to heavy timber lorry traffic and two cars suffered expensive cracks to their sumps. 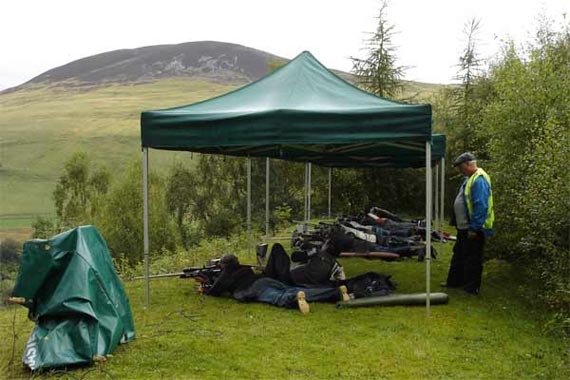 At least four competitors managed to shoot on the wrong target including this correspondent. I apologise for the lack of photographic colour to this report. It could however be accurately substituted by a single panoramic view made using Photoshop and a uniform 18% mid grey which is what the range looked like for most of the weekend. Despite all that and largely due to the gazebos the weekend was generally much enjoyed. 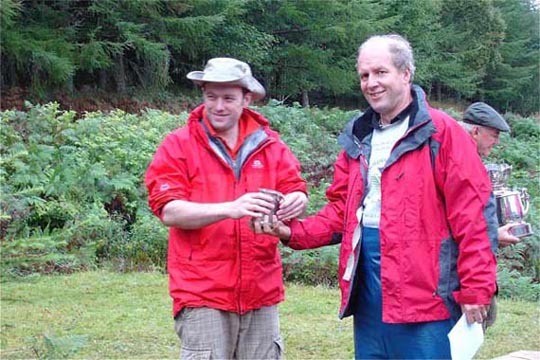 As usual our thanks go to Tim Kidner for organising everything including a particularly fine dinner in the Atholl Arms. Special thanks also go to Jim Bell and Peter Burbridge who did a disproportionate share of the target setting up and taking down.